North Myanmar is off the radar for Singaporeans as this part of the country is never advertised in Singapore. Myitkyina will be the town where Singaporean tourists will stay. For the internet generation, Myitkyina will be Singapore of over 50 years ago in many ways. The less hectic pace of life is evident here. For the baby-boomer generation, there is the nostalgia of seeing the history of urban development of Singapore some 50 years back. Bicycles and bikes are the major form of transport. You will be surprised if you see one teenaged girl cycling on the roads in Singapore. In Myitkyina Wet Market area, many young ladies just cycle to the market. Visiting Myitkyina is like visiting history. The era before the bureaucrats developed Singapore into "First World". Nowadays, they must be thinking daily of how to "recover" the costs of new fees as there is no such thing as a free lunch. Some government units start to introduce new fees to regulate the businesses. So, every year, the cost of doing business and living increases in Singapore. Something must be regulated. Get the private sector to pay. One medical equipment sales entrepreneur told me that in April 2009, every item he imports, e.g. a brand of suture is required to be inspected and fees are to be paid to the government. If he imports 1,000 items, he pays a hefty sum to the regulators. At least $20,000. For small animal practices, there is a need to get an inspector to check the safety of the autoclave. That was because there was one explosion some years ago. So, every clinic with an autoclave must get an annual inspection or face the consequences. For safety reasons. There have been some explosions of LPG gas used in apartments as not all Singapore homes have piped gas. Apartments have been burnt down. Should there be annual inspections of LPG gas cylinder valves for all apartments in Singapore. For safety reasons? For example, the Wet Market in Singapore. Old ones are torn down and new ones are built with much smaller stalls rented out at very high rentals. The rentals are market rates and only those who can afford the rates will be able to rent the stalls. 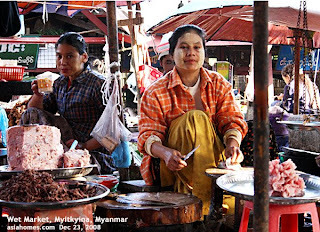 In the picture of the Wet Market in Myitkyina, you will see that the fishmongers actually sit on top of the stall table to sell her fish. Therefore, more stalls can be set up. The Market is bigger than any in Singapore. There are many farm produce and fishes not seen in Singapore. It is a great visit for tourists from Singapore. At night, there is a night-market selling all sorts of clothes and food. I walked the streets safely. Myitkyina has some modern houses too but these are few. It has a big mosque and a beautiful church. Temples and pagodas predominate the religious landscape. For those who love photography, there are so many scenes to take picture and practise their craft. Readers who are interested in a personalised tour of Myanmar to de-stress and to bond with their children, e-mail judy@asiahomes.com or tel +65 9664-0404, 9668-6468.
autoclave- manufacturer and supplier of autoclaves and provide quality autoclaves like autoclave sterilizer, vertical autoclave, horizontal autoclaves, autoclave aluminium, autoclave double drum, dental autoclave. Autoclave- Manufacturer and Supplier of medical autoclaves in delhi/india and provide quality autoclaves like autoclave sterilizer, autoclave sterilization, vertical autoclave, horizontal autoclaves, autoclave aluminium, autoclave double drum, dental autoclave wholesale supply in Delhi/NCR(Noida, Faridabad, Ghaziabad and Gurgaon).